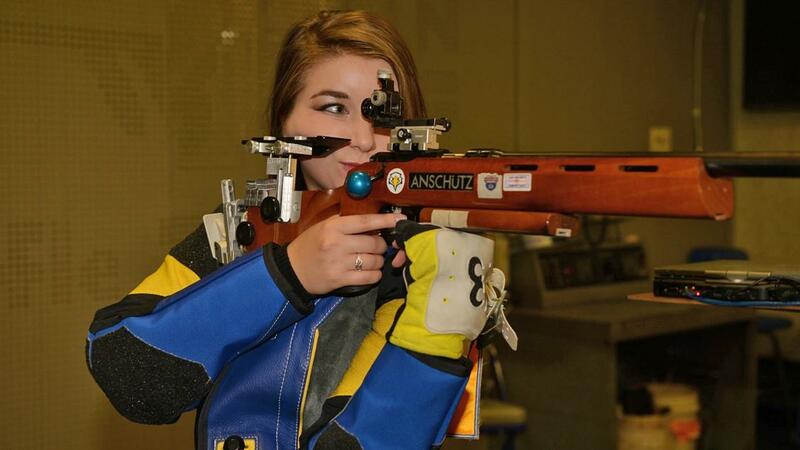 With junior Alexa Potts' emerging improvement, it seemed only a matter of time before she cemented herself as a record holder in Morehead State rifle history. Potts' school-record 595 in air rifle today was a key factor in Morehead State rifle's school-record 4,669 aggregate total and another win in a shoulder-to-shoulder match with Jacksonville State. She was five points off a perfect score. Potts, who had tied the program's air rifle individual record last weekend in the OVC Tournament with a 594 (previous record was set in 2007 by Elizabeth Lyon), connected true on 45 center shots today. The Eagles totaled 2353 in air and 2316 in smallbore against the Gamecocks. MSU went 7-0 this season in matches against head-to-head competition from one other school. Senior Siarra Crum, shooting in her final home match, saved her best for last. Crum nailed down a personal-best 591 in air rifle and added a 555 in smallbore for a personal record 1146. On the smallbore range, fellow senior Brandon Bryer closed out a storied home career with a personal standard 583, which included his best marks ever in kneeling (195 [tied]) and standing (191). Sophomore Ryan Hinson totaled a 579 smallbore score, helped by a personal-best 200 in prone with 18 center shots. He also ripped the target for a 588 in air rifle. Freshman Erin Diehl had a 577, which included her tying her best prone score at 197. Fellow frosh Amber Schifano also collected a personal best with a 196 in prone, tying her best mark in her first collegiate season. Another notable personal score came from junior Jesse Moyer, who had a 585 in air rifle but was not a counter in the team score. Morehead State, which still has a chance at an NCAA Tournament bid (top eight national teams advance), will shoot at the crucial NCAA Qualifier Saturday at Kentucky.